This Telescope 2 light cylinder shade spotlight floor lamp in matt black is contemporary and unusual. Featuring a circular base and slender stem, with large upright stirrup and two adjustable cylinder shade spotlights. The cylinders swivel in the stirrup so that you can direct the light wherever it’s required. Designed for use with very bright LED spot light GU10 bulbs up to a maximum of 10w each and fitted with a convenient foot operated switch. This floor lamp provides two bold directional beams of light that will highlight whatever you like in a living room or home office. 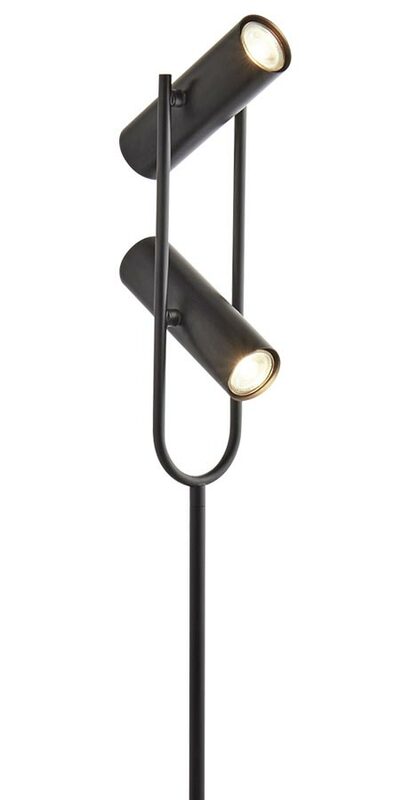 The matt black body is sleek and is sure to bring a stylish minimal feel to your home and the fully adjustable heads can be tilted to provide more or less light. There are matching fittings in the Telescope lighting range that includes single and three-light pendants and a single light table lamp; please see below. Also available finished in polished chrome, please enter the term Telescope in the search box at the top of this page for the complete collection. This floor light is supplied by Searchlight who manufacture some of the best traditional and modern classic designs such as the Telescope 2 light cylinder shade spotlight floor lamp in matt black you see here.